Amy Lynn T. submitted this photo and caption. At my college residence hall, one of the residence assistants had a "Paint the Basement' program where you could paint the walls of the basement with anything you wanted, as long as it was proper. Because color guard and drum corps are some of my biggest passions, I wanted to do something related. 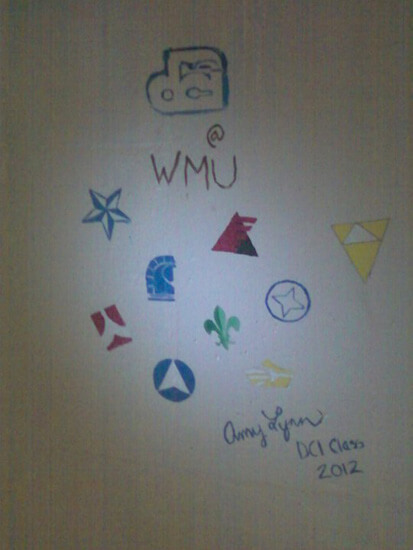 I remembered that many other people on my campus also marched in different corps so I decided to do my portion of the wall dedicated to all the DCI-ers at my university. Each one of the people I know has their corps represented, and if they marched two, both of them are there. I can't wait to meet more people and add more corps to the wall!